It will come as no surprise that world-renowned multimedia artist Robert Lepage has branched out into the realm of the graphic novel. But of course, not wanting to be hemmed in by a strict number of frames and pages, Lepage gave Quebec illustrator Fred Jourdain the opportunity not to simply make a graphic novel, but to create a graphic representation of Lepage and Marie Michaud’s The Blue Dragon. Jourdain’s graphic version is intended to be a snapshot in time of the stage play, which even includes last minute dialogue updates to reflect the most recent performance (at the time in London). Jourdain’s only ground rule for this two-year project was that it had to reflect the stage production 100%. The result is a stunning 176-page work, combining pen and ink drawings, Chinese calligraphy, digital colour and a few innovative twists to the traditional graphic novel layout. In The Blue Dragon, the reader meets art dealer Pierre Lamontagne, the central character in the Dragon’s Trilogy, twenty years later in Shanghai. At the airport in the opening scene, Lamontagne greets Claire Laforêt, a former lover from art school. A 46-year-old ad agency owner, Claire has come to China for a specific purpose, which she hopes will bring greater meaning to her life. A romance is briefly rekindled between the two, but unresolved conflicts surface, leading to confrontation over their respective life choices. Claire’s re-emergence also impacts Lamontagne’s current relationship with the much younger Xiao Ling, a young Chinese artist exhibiting her work at Pierre’s gallery. Xiao Ling has to face an important life choice, which fills Claire with hope. The intersection of the three characters leads to irrevocable change in their lives. All of this takes place in the rapidly changing landscape of modern China. Best-known for his illustrations of jazz, rock and film stars, Fred Jourdain had never completed a full-length bande dessinée before. Lepage and his theatre company, Ex-Machina, selected the 26-year-old mainly for his highly cinematographic style, his sense of mood, treatment of ambiance and his focus on the feelings and expressions of his characters. A major challenge for Jourdain was dealing with large chunks of dialogue. In many instances, the artist opted for detailed double-page scenes with the dialogue entered unobtrusively in the margins, a great solution for what would have otherwise been heavy speech balloons. Jourdain also did a fabulous job of creating ambiance through colour and establishing pace and mood with double-page metaphorical illustrations without any dialogue. Perhaps the most appealing aspect in this adaptation was page layout. Unlike some graphic novelists who use the same number of panels throughout their work, Jourdain’s layout changed with every page, offering the reader an element of surprise and making The Blue Dragon more art than graphic novel. And like all good art, it is possible to go through Jourdain’s interpretation many times, finding something new with each reading. Although some of the illustrations of the characters are a little too static at times, overall it’s a superb piece of art by an emerging artist whom we’re bound to hear more of in the future. The more-art-than-comic approach to The Blue Dragon may be the stroke of genius to win over the reluctant adult who still sees the graphic novel as strictly for kids. What’s more, because Lepage has reportedly no immediate plans to make any other graphic representations of his work, my guess is that this little gem may soon become a collector’s item. 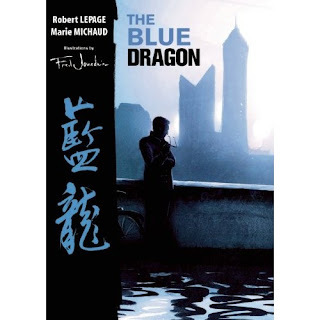 : Review: The Blue Dragon by Robert Lepage and Marie MichaudTweet this!